Draw space pirate character design tutorial. We have two space pirates here and some background. 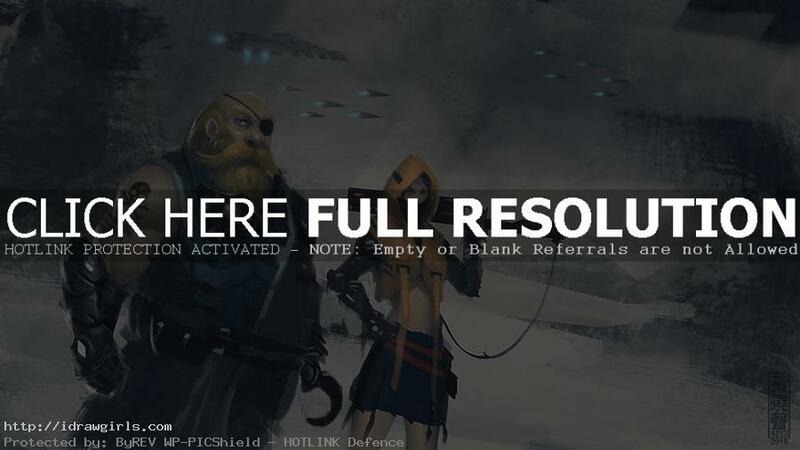 This tutorial shows you how to draw and paint a character design of space pirates. This tutorial shows you from drawing step to rough finished painting. It is not quite done yet. It is still a speed painting so I plan to take it further some time in 2016. You can scroll down further to see step by step images with instruction. In this tutorial I start with a rough idea of a couple of space pirates in some deserted planet. I first explore with background using lasso tool and texture brushes. Then I basic flat brush to establish base shape for both pirates. At this stage, I only focus on big shapes and general feature, lighting and base to get the overall look and feel of the characters first before I can design the detail of the character. Once you have a good silhouette and general idea for the character then we can start doing more detail. You have to first take care of the big shape then you can think about adding facial structure using values then adding costume design to the character. Shapes, precision and lighting are essential to any painting. I use a lot of normal layer and just paint like I would paint traditionally in this video. But with lasso tool and custom brushes, it makes my job a lot easier. Hopefully this can be really helpful to you all. This time have a very good idea of what I want to paint and how it should look before I begin to paint. So it is going smoother than usual. But sometime, I will just let the visual shapes and color guide me as I go. Tips on speedpainting. Keep it simple first and make your image clear and easy to read or identify.